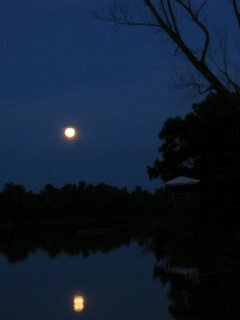 Moonrise on the river last month. Those of us who remember Art Linkletter remember that he had a TV show called Kids Say the Darndest Things. This was located, in time, somewhere deep in the recesses of the last millennium. And on his show they did, sometimes, say things that were surprisingly wise. This week I was in the company of three grandchildren, ages 11, 11 and 9. It had been a kind of slow afternoon for them, both Carolyn and I had to be doing some things on our own that day. When I came into the living room, all three of them were sitting on couches looking very bored. I guess I kind of lit into them for not taking advantage of being in a place where the outdoors is where things are happening, rather than indoors as they are used to in the city. I pointed out this, and I pointed out that, and I guess I concluded with saying that the WORLD was outside the doors, and they could at least have spent time on the big ten-foot-wide porches we have in front and back of the house. Anything to get outside and take in some of the huge natural setting that was being offered to them. I guess I was a little upset because I thought I was offering the world and they were inside being bored. They listened more or less politely to me, as I proved once again that in their limited experience their grandfather is somewhat strange. After this they kind of uneasily went about doing things indoors, not to let on that I might have said something that might have some merit. But, about an hour later, I was in the kitchen and overheard the following short exchange. “Why don’t we go outside?” then “What’s outside?”, then, “The world [pause], apparently”. I started laughing and I still can’t get it out of my mind. What kids! I love them all. After all this we went outside and they learned to identify poison ivy, and how to handle a rifle. 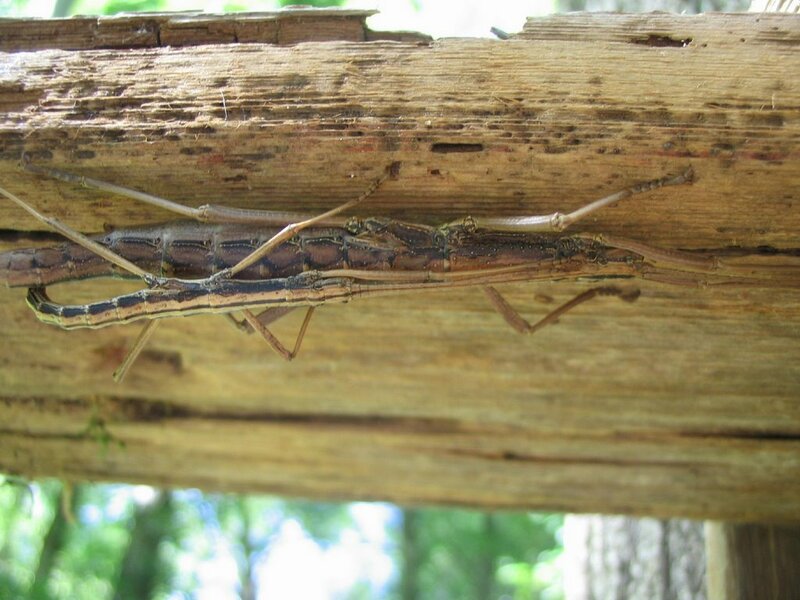 The walking sticks are frequent inhabitants of my birdhouses. Since they are always coupled, as shown, I would imagine they value the privacy of the dark little box, or maybe just the darkness. The river is at 2.9 on the Butte La Rose gauge and is showing .5 foot tidal fluctuation now. The Ohio and Mississippi are both showing small rises, and that’s a good thing. It should at least hold things from dropping even lower. 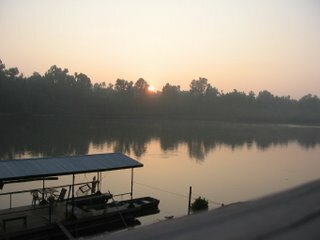 Sunrise on the Atchafalaya the morning of June 21, the Summer Solstice. Despite Hollywood claims, this is The Longest Day, of this calendar year anyway. According to the ancient observances, this marks the rapid growth phase of all the things we planted this spring. This includes the ideas and encouragements that we began on the Winter Solstice – time to take stock of how we are doing on the year we planned for ourselves. 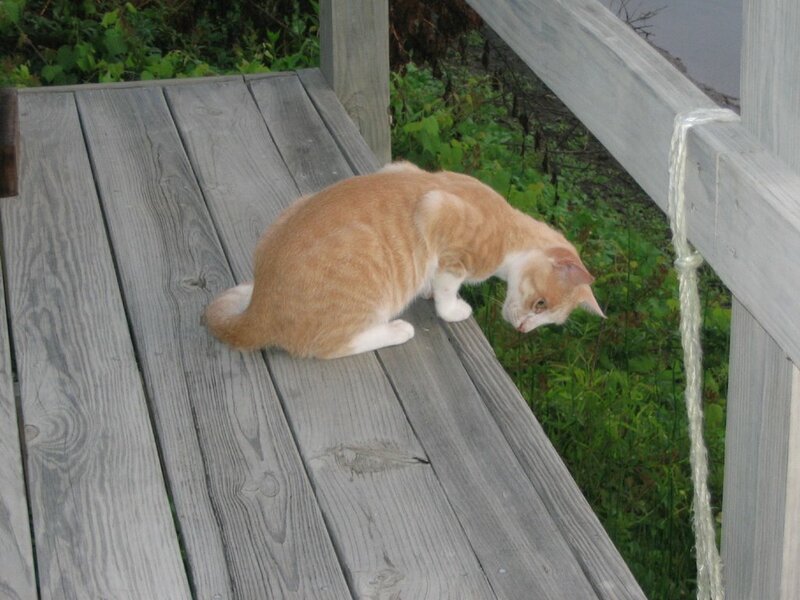 Napoleon, looking down off of the deck, ten feet above the rustlings and flittings in the brush below him. Kind of scary to be a mouse or bird or whatever down there being evaluated by a predator like that. 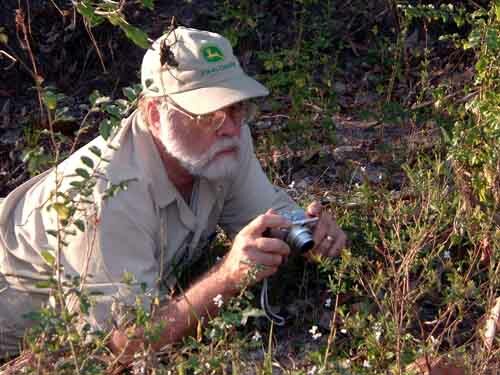 A leopard would be doing the same thing in Africa, and the rustlings might be made by us. A large gator swam up the river three days ago. I was sitting on the dock and happened to turn and look back and saw him coming up the river, angling toward the dock ever so slightly. He was about 50 yards away when I saw him. He didn’t seem to be very alert to the danger presented by humans. When I moved to get the camera, instead of instantly submerging and swimming away, he just angled away, but kept going upriver slowly. As I watched him he got further and further away upriver and finally I gave up and walked back to the house. That’s him as he passed the dock beyond Alcibiades. I estimated him at six feet and remarked to Carolyn that this was bigger than you usually see around here. 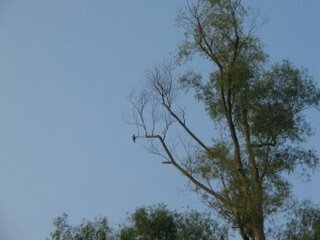 I came down that night and could see his eyes up against the bank about 200 yards above our place. 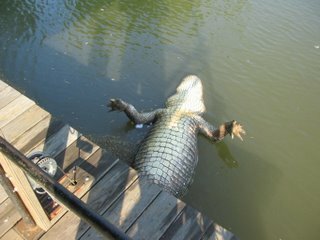 This morning I came down to the river and this is where he was, very dead and floating high and stuck under our dock. He was a lot bigger than I thought, at least nine feet long. He must have been hanging around, a little too fearless, and someone with a deer rifle did him in. Too bad, but I am glad that he isn't around. He would catch an unwary Napoleon for sure. And then there are those recent stories from Florida. The river is at 3.0 on the Butte La Rose gauge, falling to 2.0 by Friday. Man, that's low. the Mississippi and Ohio are still slowly falling. Another nice sunset on a cloudless day last week. Today is Saturday, and evidently it is a proclaimed work day for the hunters on the lease across the river. I believe they must all agree to gather at the river on certain days to do important things to the deer habitat so that the deer are happy and contented. This must be a male bonding event. First of all, there are 37 pickup trucks parked at the little private landing they use to launch their boats. Notice – 37 pickups, not one non-pickup in the parking lot. And some of the trucks are new and some are older and kind of grungy. 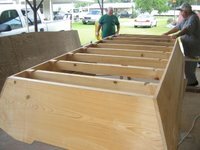 Some are attached to boat trailers, and some to those big flatbed trailers that they use to haul four-wheelers. Definitely a status and rank thing here. I believe those trucks not attached to something must belong to the most junior members of the club, except the most senior guys don’t pull anything either because they delegate that honor. The middle rank gets to haul the trailers because they know the ropes and they then will teach the juniors. When they have enough experience, they too will rise in rank and delegate. A lofty goal few must attain, otherwise there wouldn’t be enough guys to pull the equipment around. At 7:00 am this morning they launched the boats and loaded the ATVs on those boats that are specially modified, and they crossed the river. It looks like an invasion with vehicles and camouflage and everything except guns (I think). Right quick after they reach the other bank and unload the ATVs, the engines start and the day of manly pursuit begins. Out into the forest they go, literally whooping and hollering, and probably trying to make the ATVs do wheelies. Apparently the few storms we have had over the past several months have laid impediments in the paths of the ATVs, because out come the chain saws. Three started at once, each identifiable by the roar or whine or scream that it made – then a sustained buzz by one of them, and a silent moment, and CRACK, and whoomph – down comes the impediment. 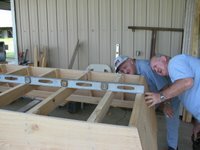 These men will work most of the day in the 90 + degree heat, and sweat, and drink beer and have a good time, and handle man-tools, and grunt a lot, and go home feeling close to nature (and each other in a guy sort of way) because of it. And the deer will enjoy the food plots provided for them, and they will enjoy those nice wide open lawn-like areas that stay mysteriously uncovered by tall weeds, until those open areas become shooting lanes in the fall. Who says man and nature can’t live together in harmony? And is killing deer really the main object of belonging to a hunting club? Maybe, but the work days sure seem to provide more entertainment for those of us on this side of the river. The river is at 2.8 feet on the Butte La Rose gauge, going to 2.5 by Tuesday. And for one small personal reason, at least, it’s a good thing it is that low. This morning I was out on the dock making sure there were no active wasp nests that the grandkids coming to visit today could get into. I killed one nest and for the heck of it I sprayed into a two-inch horizontal pipe that has had nests in it before. Well, out came a bunch of mad wasps not completely done in by the spray. They were pretty sick so I wasn’t much worried but one landed on the side of my head. When they do that it’s a good idea to remove them quickly, and I did, and with the swipe of my hand I removed the wasp and my glasses as well and sent the glasses flying into the river. These are not the most expensive glasses you can buy, but they did cost over $300, not to mention that I need them to see. I have a big magnet that I use to pick up nails accidentally dropped in the yard. Did you know that there is no metal in today’s eyeglasses that is magnetic? I do, now. So, it’s overboard blind in seven feet of water and feel the bottom with your hands. After hopefully calculating accurately how far the current would carry these weigh-nothing glasses, I dove many times for the bottom and found all kinds of sticks and debris, and eventually the glasses too. Much relief. If the water had been two feet higher, I don’t think I could have done it. 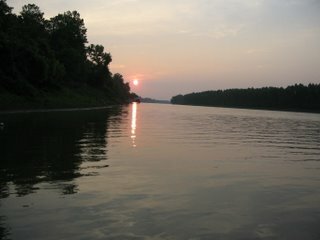 The Ohio and Mississippi are both rising slightly but nothing to affect us. I am working with some bones from my archaeological reference collection right now. Napoleon hopped up on the table and acted like he could tell there was som ething animal-like in all the containers in front of him. The disarticulated skeletons of ten different mammals are in the containers, and most of them have been disarticulated for 20 years. Is it possible that he can still pick up some clue about what they were when they were alive? He acts like he can. The bones are used to help identify animals that Native Americans used for food in the Atchafalaya Basin many centuries ago. It’s kind of like a puzzle, being able to find just one end of one bone, then compare it to the reference collection and being able to identify the animal as a beaver, or otter, or deer, and then being able to calculate the relative importance of that animal in the diet of those folks who lived here so long ago. Studies I have done in the past seem to show that deer and garfish were two of the important animals in this respect. The fish in the tub are some my friend and son-in-law Danny and I caught last fall. There was a little bit of lots of things, as can be seen. 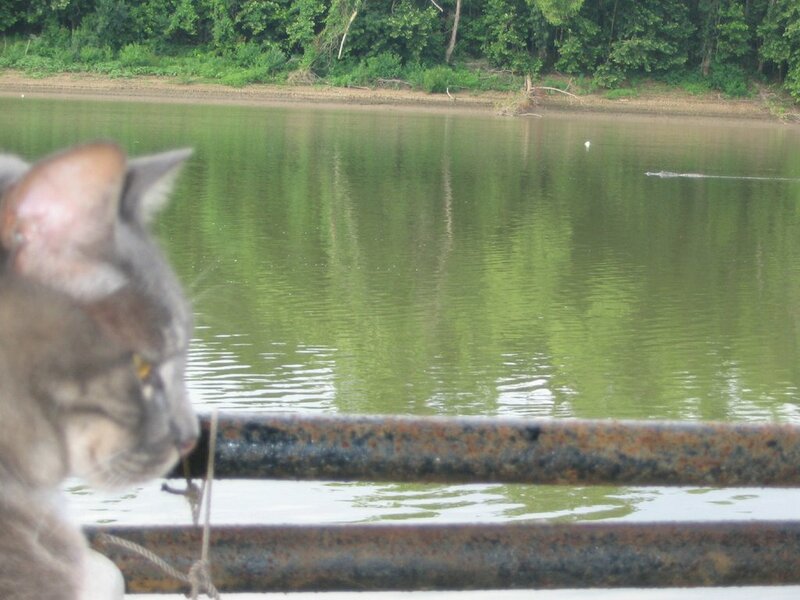 Napoleon likes catfish; he wasn’t impressed with the fish with scales. I think he dislikes the scales in his mouth. The river is at 3.4 on the Butte La Rose gauge and will stay there for a few days. It looks like low water is with us until the cycle shifts to higher water again next winter/spring. 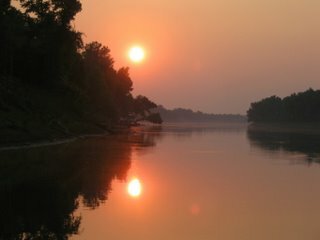 The Mississippi and Ohio are settled down to a long summer’s lazy pattern of little rises and falls. Sunset a couple days ago. It rained this evening, about 0.5 inches. If we could get this every day, like summers when I was a boy, things would be just fine. I remember sitting under a shed with my father’s hired hand during slow, soaking afternoon rains. It rained like that a lot back then. 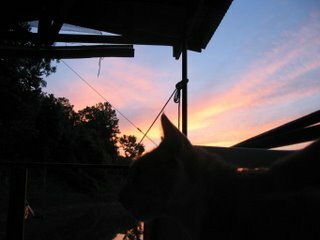 He and I would sit and talk and listen to the rain on the tin roof when I was about seven, I guess. He was a black man, and wore blue coveralls and a gray long-sleeved shirt, and I thought he was about the most interesting and smart person I had ever met. He knew stuff about almost everything. He knew about planting things at the right time, and the moon was a big factor in making that decision. I remember wondering how that could be, with the moon being so far away and all. But when he planted things they always grew, so I didn’t question his wisdom, just my understanding of it. He knew things about fishing too. He said I had to spit on my bait to catch fish. 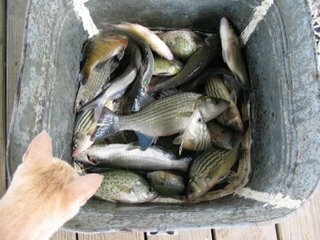 Afterwards, I always seemed to catch more fish when I did that, so I guess he was right. He knew that when an owl called near a house, someone nearby would die soon, but I never quite verified it. Sometimes he would hitch up Jack, the horse, to a farm wagon we had and he would drive the wagon to a place we owned south of New Iberia. I remember feeling very important sitting up there on the seat with him, as he and Jack would take us down the gravel roads, a red bandanna hanging out of the man’s back pocket. There was a pen with a 1000-pound sow hog in it (there are pictures) and he wouldn’t let me get close to the pen because the hog killed anything it could catch. Back at the house, he always had to eat dinner by himself out in the back of our property under the shed where we listened to the rain. I didn’t understand that either, that he was always alone, I mean. When I asked my parents why he d id that they told me it was because he was who he was. That didn’t make any sense to me then, and it still doesn’t. I wish I could recall his name, but I sure remember him. Is there any significance to the fact that I remember him, this man that never amounted to much by some accounts? I think so. He enriched a young boy’s life with memories that have lasted 60 years, and if his spirit dwells in a space unknown to us, I hope I am helping to give it strength. And when the fish are slow to bite, I still spit on my bait. I remember that he liked garfish. And I think the pictures I include here would have made him happy. The pictures are not mine, but I would like to share them anyway. I am very leery of internet images; they are so subject to alteration, or outright falsification, but look at the picture of this fish’s tail. 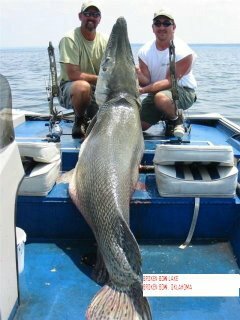 It is so huge, and who would try to fake a fish tail? There are gars like this in the Atchafalaya, right here behind the house. I see them rolling sometimes. One swirled at night once right next to my boat as I ran the trotline and I swear it scared the bejeezus out of me. It had that deep, water-slosh-kerwoosh sound that few things can make, unless they are very big. And why would that scare me? 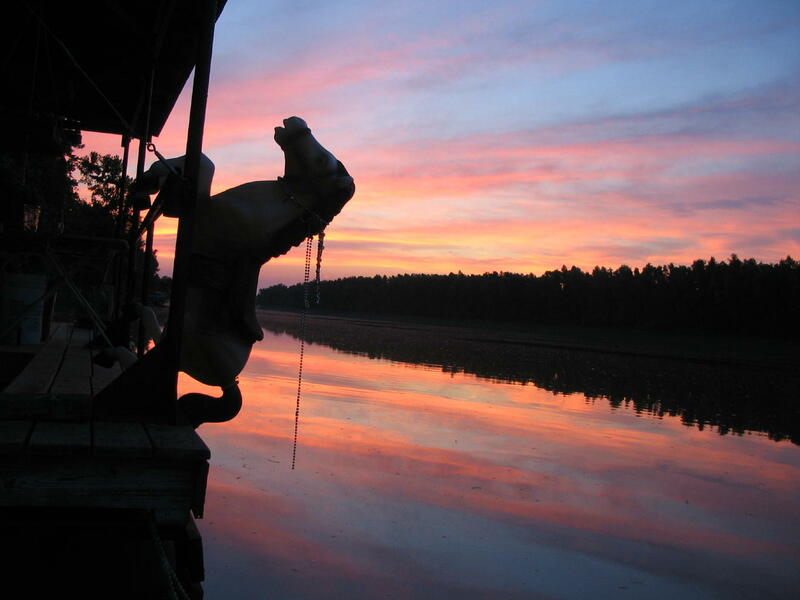 Because at night, on the river alone with just a paddle and your imagination, anything is possible. The river is at 3.9 feet on the Butte La Rose gauge, and falling to 3.1 by Friday. The Ohio and Mississippi are both falling again. C’est la vie. Except for small finishing touches and detail, we completed the apprenticeship boat building project today. The primary goal for the final day was to put the bottom on, and we did that. 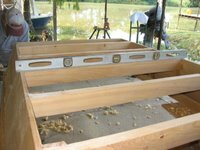 To begin with, we needed to finish what had to be done before the bottom was fitted, do those things you wouldn't be able to reach with the bottom in place, including drilling the remaining drain holes in the bulkheads and the stern board. 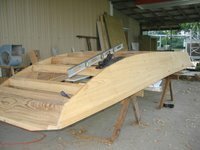 A few days ago Edward had taken the 16-foot piece of ½ inch marine plywood and placed it so that it would bend at one end, preshaping it to bend to fit the upcurved bow of the boat. He poured hot water on it where he wanted it to bend, and this worked. 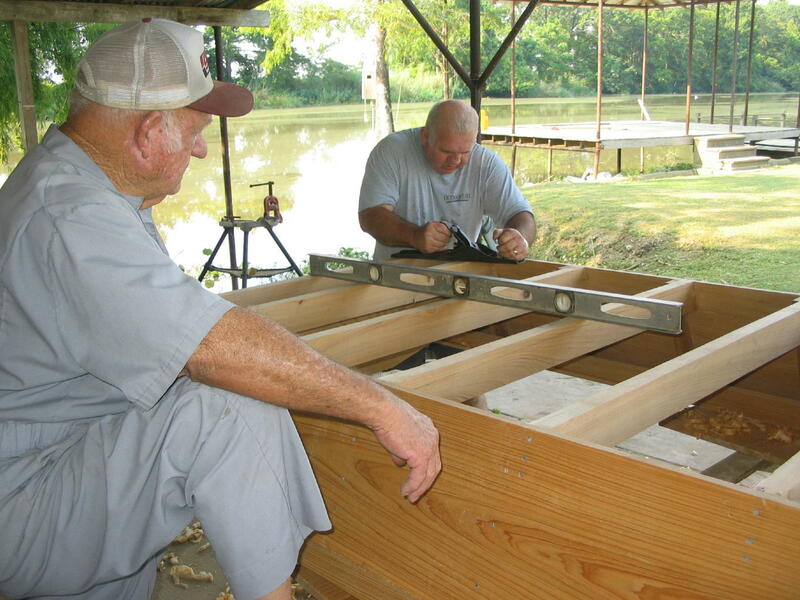 We took the plywood and placed it on the upside-down boat and put three nails to hold it in place where Edward wanted it. 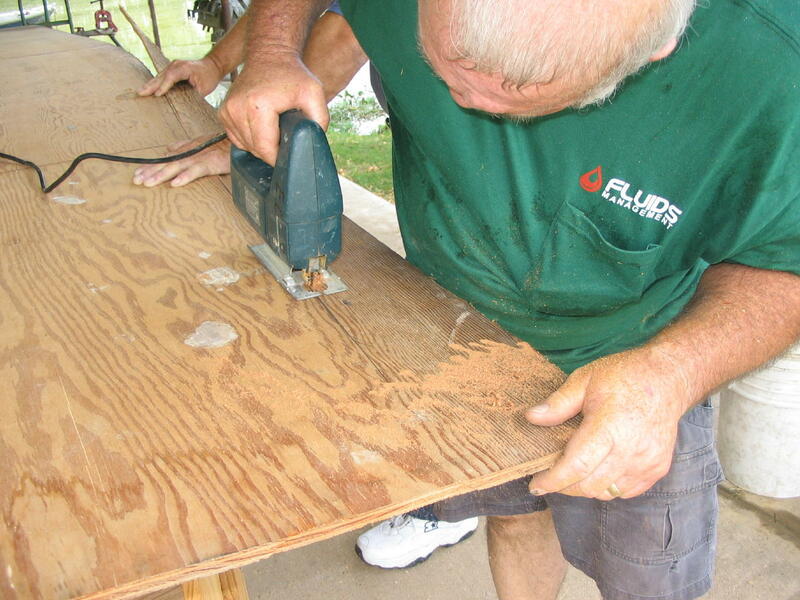 He then marked the plywood with a pencil where it needed to be cut, and then cut it. At this point, the time-critical part of today began. The boat was now ready for the glue that would fix the bottom in a leak-proof seal, and the glue had to be put on all of the places the bottom would touch and the bottom placed and nailed down before the glue dried. I’m not sure how lo ng before the glue would be too dry but probably between a half hour and one hour. 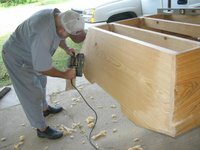 So, three people, Larry, Justin and Edward started smearing glue on the timbers, gunnels, head block and stern board as fast as they could. 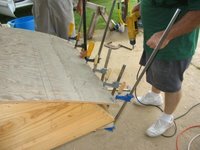 And then, after placing the bottom on the boat, they did a real production line of drilling and nailing the bottom on, beginning from the stern board and proceeding toward the bow. 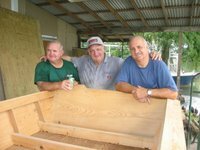 These three experienced carpenters can put a lot of nails into wood very quickly, even with old-time hammers. 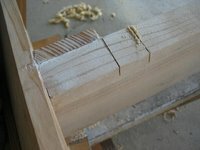 Once the rest of the bottom was nailed down, it remained to force the forward end of the bottom down to meet the head block, and that wasn’t easy. Notice how many clamps that it took to bend the ½ inch plywood. 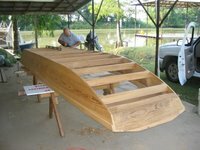 I asked Edward how they did this many years ago in the swamp, without all those clamps, and he said everybody would come over and as many as possible would sit on the boat or pull down on the plywood to make it bend down to fit the bow. 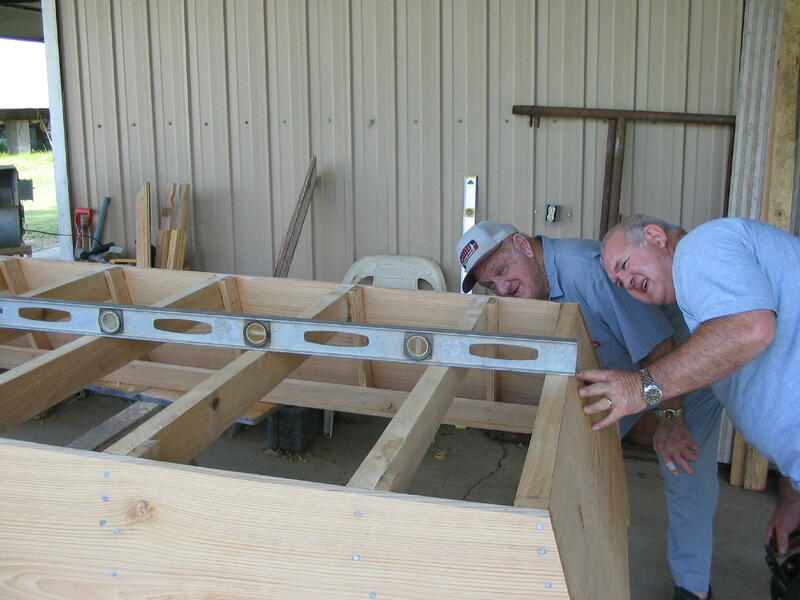 Once that was done, a lot of nails (and for us, screws) held it in place. 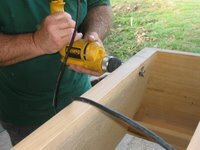 The screws we used are stainless steel and that’s cheating a little, if we were to be doing this totally in the traditional way. But that’s ok; we liv e in this world now. Anyway, in the Basin they didn’t have electricity to run saws either and without power tools this project would not have been finished on time, which it was. Last time I mentioned that the tools for each phase of this project changed with the job to be done that day. 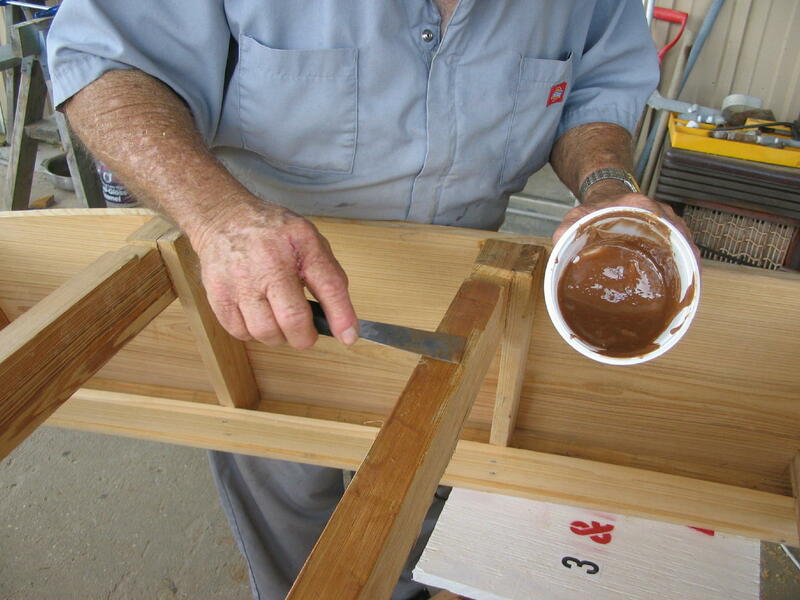 Today the tools were a h ammer, nails, a drill, saws and clamps – and glue. 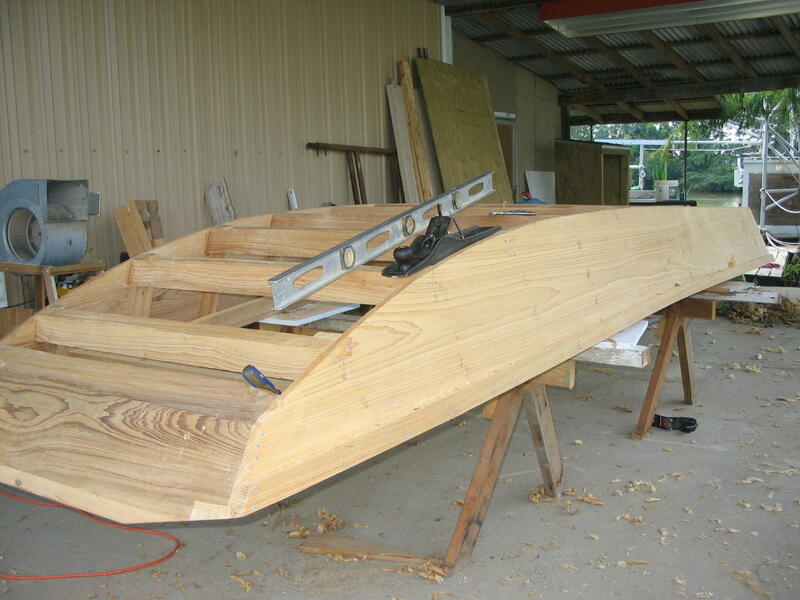 So, essentially, now the boat is finished. If you put it into the water and put a motor on it, it would do what it was designed to do. It is a beautiful thing, both from a practical view and from a more esthetic one. 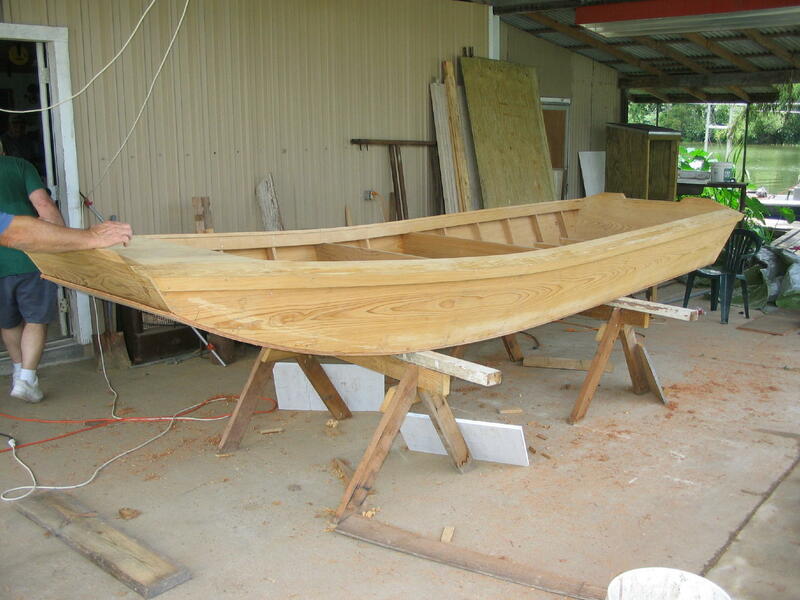 The fit of the pieces, the strength of the joints and corners, the graceful curve of the rake of the bow and the overall proportions make this more than just a tool, it is the proud accomplishment of a proud master craftsman and his apprentice sons. 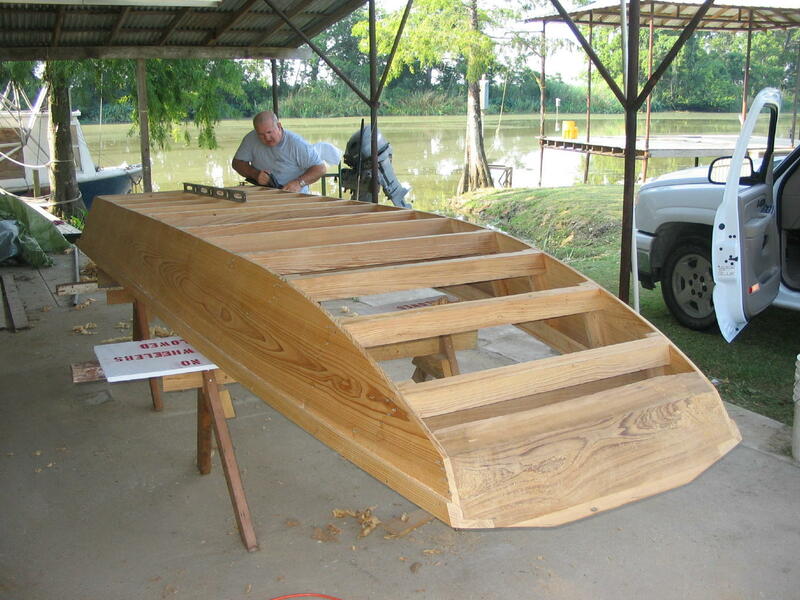 Indeed, the state of Louisiana has helped to preserve the skills of traditional boat building by providing the funds to purchase the materials for this project. 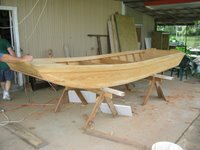 The intended result of the grant was to convey knowledge, and as proof that that has taken place there are plans to build another boat, this time with one or more of the apprentices as the lead craftsman. I wish them well. Throughout this project I have been videoing all of the important steps that led to finishing the work today – from selecting the cypress boards many weeks ago to nailing the bottom on today. There are also about 800 still images of the details of the work all along the way. The intention is to reduce the 14 hours of video to a documentary of one hour or less and make that available to anyone who might have a use for it. The still images would make a good PowerPoint presentation, I believe. It has been my privilege to do these things. Sunset this evening on the Atchafalaya was fittingly gorgeous, the end to a very good day. The river is at 4.3 feet on the Butte La Rose gauge today, falling to 2.4 by Thursday. 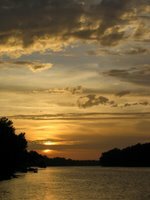 The Ohio and Mississippi are showing small rises. Hopefully they will provide enough to keep us wet, at least, this summer and fall. Sunset on the river yesterday. Yes, it rained about an inch and a quarter today. It rained hard and fast and when it finished (after about an hour and a half) there was none on the ground. Just sucked up and disappeared, it did. Maybe the figs and other things will grow some, they look pretty puny right now. This time of year we have all the hatchling prothonotary warblers and their parents wanting to bathe in our birdbath just before dark. Now, it rained hard on them this morning, and I know they got very wet, but here they came again to bathe before retiring for the night. Two baths in one day, hm. All those bright yellow birds around the bath rim (as many as 14 at one time) is pretty impressive. I had to put up a wire cage around the bath to keep some space between Napoleon and the birds. It works, and he doesn’t’ like it. 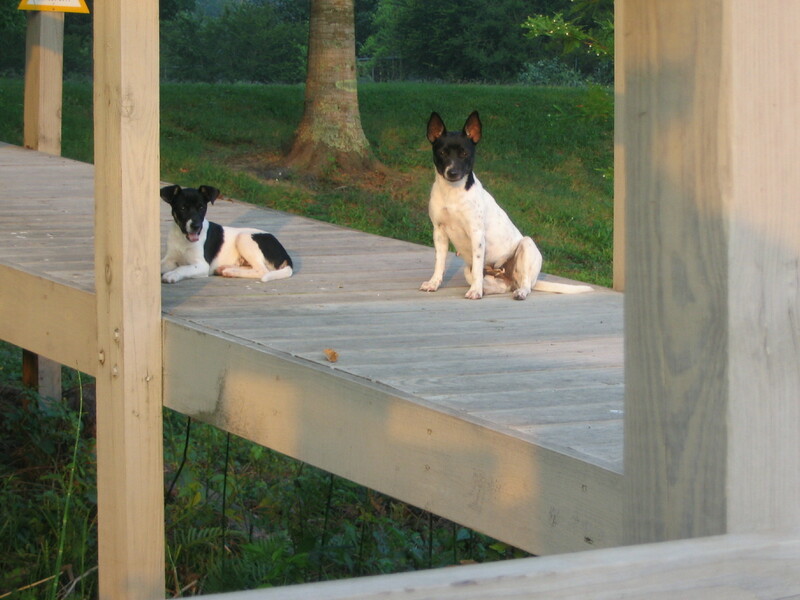 No hits yet on the little dogs which you can have just for the asking. Napoleon will tolerate a lot from them, but when it comes to the dogs coming onto the dock, which he apparently considers to be his, he becomes possessive. 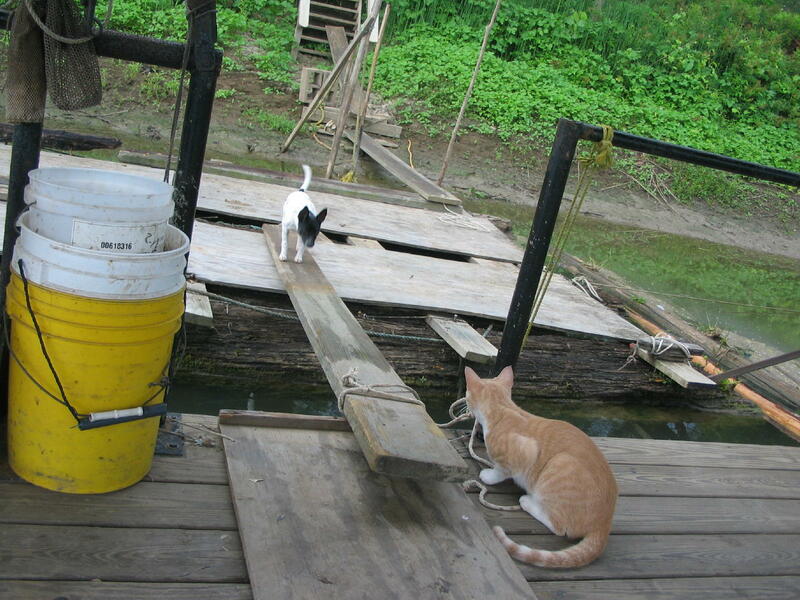 He set up at the end of the gangplank to the dock and dared the dogs to come across. They didn’t. There is a lot more disease among the garden plants this year, more than usual I mean. We lost half of our tomato plants to some kind of wilt, and some of the cantaloupes died too. I have never had either of these happen. Could it be that we need more of a winter than we had? Could cold weather keep some things in check? Another thing is wasps. I have no quarrel with wasps, but this year there seems to be a lot more nests than I’m used to seeing. I don’t kill them if they’re not where we walk around, but I had to kill seven paper wasp nests in the boathouse today – seven! Three would be a big number in earlier years. I also had to kill a cottonmouth moccasin yesterday. It was near the shop and too close to where we need to be. I would have removed it instead of killing it if I had had the time, but I didn’t. The river is still at 4.4 feet on the Butte La Rose gauge, falling to 2.2 by Wednesday. 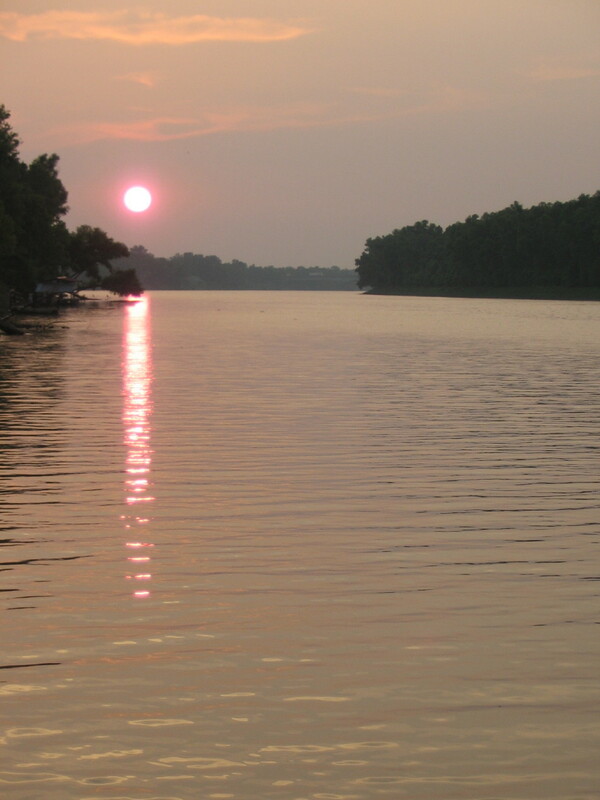 At that stage it gets so shallow at the junction of the Atchafalaya and the Whiskey Bay pilot channel that you have to be careful even in an outboard. The Ohio and Mississippi are either on a stand or falling. 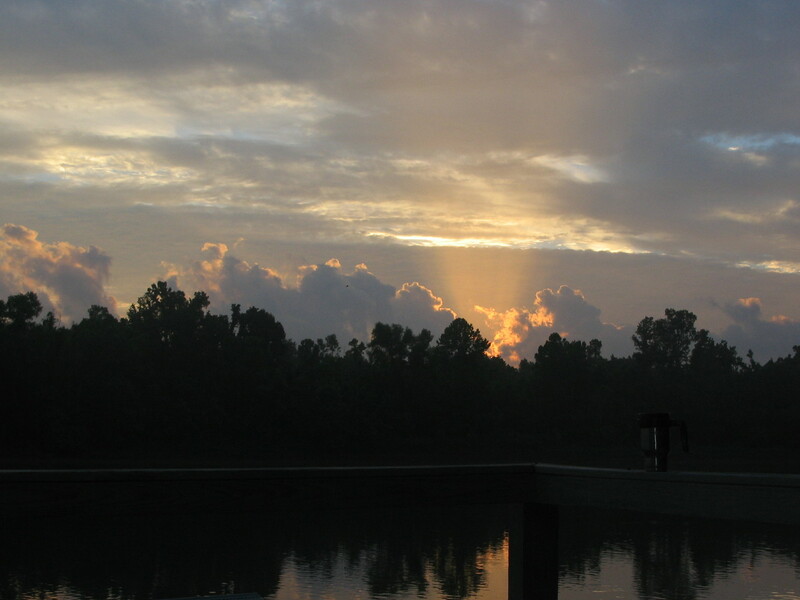 Sunup this morning. I have it in here twice but Blogger is acting so weird that I’m afraid to delete one for fear that all the other pics will disappear too. That happened once today already. When the cats come down to the dock with me very early in the morning, they usually settle into grooming themselves for the day. It’s as if they think that something really important is finally going to happen to them on this day and they need to be as presentable as is felinely possible. One would think that Alcibiades might be a little reluctant to present himself to a public too quick to call him overweight, or downright disgustingly fat. No, not him; he moves around the yard with a light step and gazes at you from the dock railing with a regal countenance. He looks at Napoleon and his svelte, slim body and seems to say he doesn’t care. There is no stress in his face, no diets on his mind. He is who he is. You can learn a lot from cats, I think, if you pay attention. Life on the river the last three days has involved the addition of two needful little dogs, a mother and her three-month old (guessing) puppy. They just appeared in our yard, having been dumped near our house by someone who apparently didn’t want them anymore. I’m saying this in the blog because we are looking for a good home for them. If I had to guess as to the breed, or what might come close to a breed, I would say Cajun squirrel dog, which surprises me a little because those dogs are not cheap to buy. The mother weigh s about eight pounds and the puppy three, maybe. They are about as cute as these dogs can be, and polite, and respectful and grateful for food, eating it with more manners than you might expect from cast-off dogs. These would be perfect for a family with small children. We had our granddaughter Elena (who is one) with us, and them, for three days this week and they stayed around her without frightening her at all – pretty remarkable. These guys will pay their way in personality, believe me. Why don’t we keep them? Because we will be traveling a good bit soon and the timing for owning dogs could be better for us. 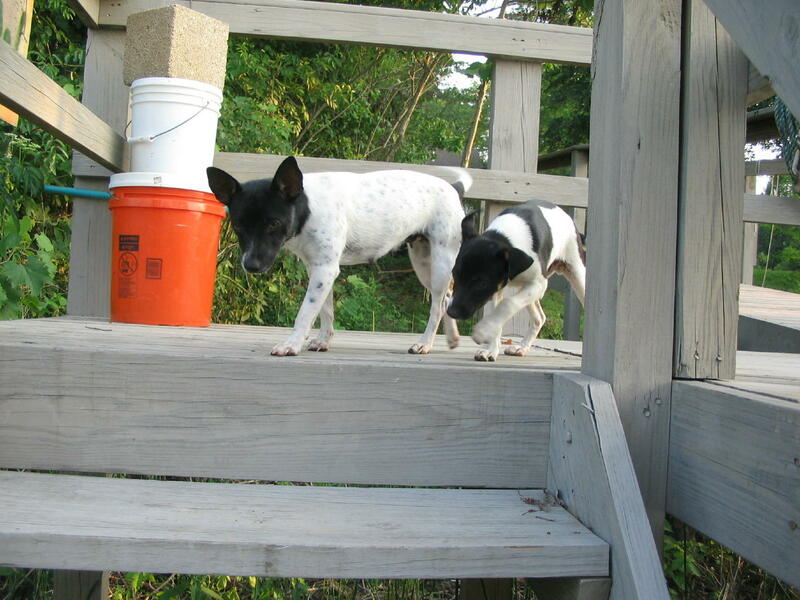 If you, or anyone you know, would like to take responsibility for these two little animals-without-a-home, let me know and you can either come here to get them (and I’ll even throw in one of my 301-year old cypress birdhouses), or I would be willing to meet somewhere within a reasonable distance from Butte La Rose. Either comment to this post, or see my profile for an email address. Napoleon has reserved judgment on what he considers to be the two invaders. 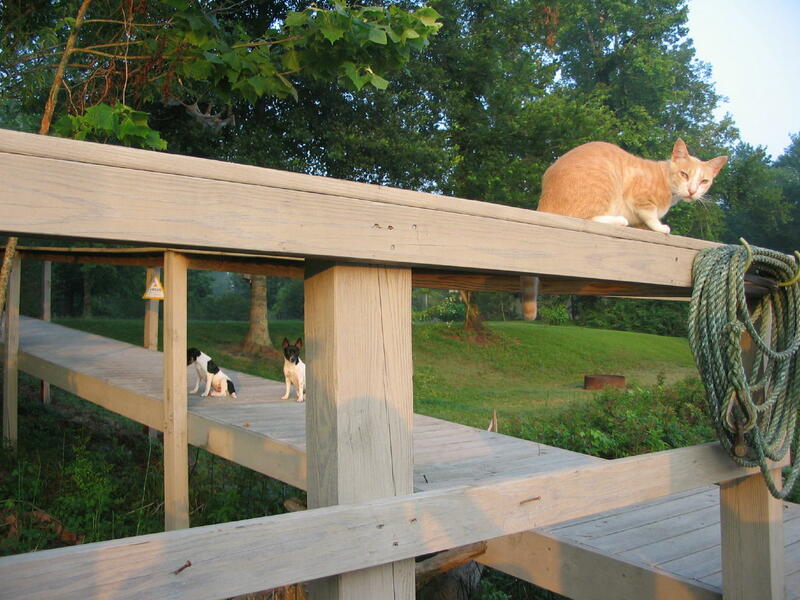 He spends a lot of time on the walkway railings where he can look down on the dogs, believing, I’m sure, that he achieves some psychological advantage that way. The river is at 4.3 feet on the Butte La Rose gauge, and will fall hard to 2.8 by next Wednesday. Man, that is LOW for this time of year! The Ohio and Mississippi are both falling too, with no bottom in sight. Sunset a couple nights ago. I had to load an image to test something for Blogger so I thought I might as well just put it out as a very short post. 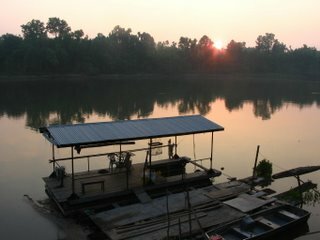 Sunup on the river this morning. The mayfly emergence is three days old now, and it is diminishing but not over. What kind of feeling is it that you get when this is out in front of you? 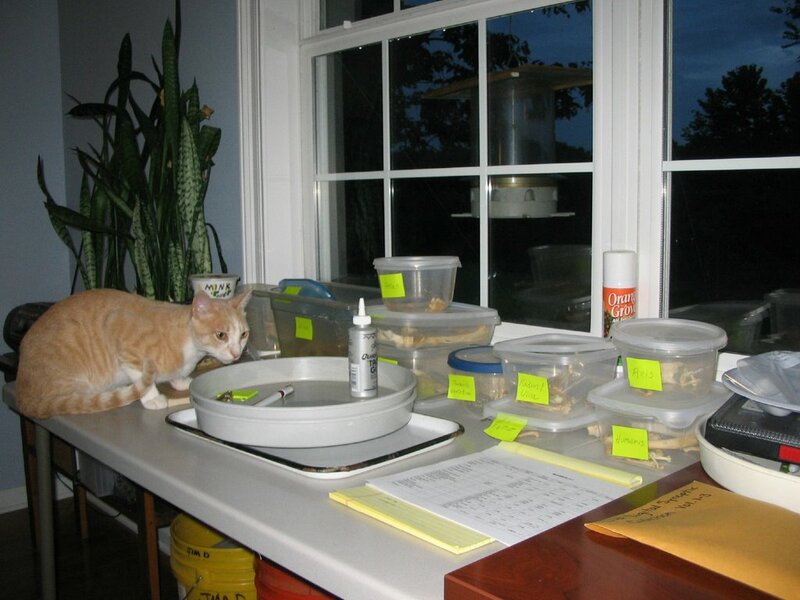 Wonder, for sure, but awe also, and curiosity at the different things that come to the rich table of insect protein. It just seems that everything out there eats them. I guess that’s not so good for the individual mayflies but it sure is good for everything else. 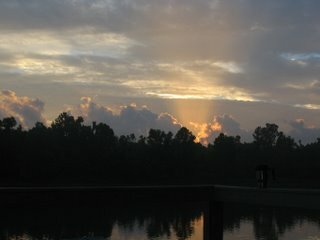 Here are a few things I saw this morning at sunup. 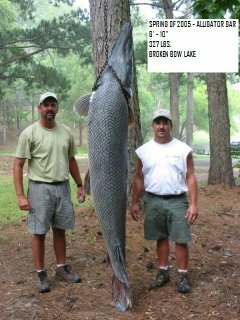 First of all, the gars. They are shortnose gars and they are everywhere, just skimming the surface of the river with their noses just under the water. This species is not large; most of them are between two and three feet long. You can easily see a hundred of them at one time, and they can see you but they don’t seem to care. They sit there just below the surface and fan their fins and tail just enough to make a little headway against the mild current, or just to maintain a position and let the current flow by them. As floating mayflies come by, the gars just inhale them, almost lazily. 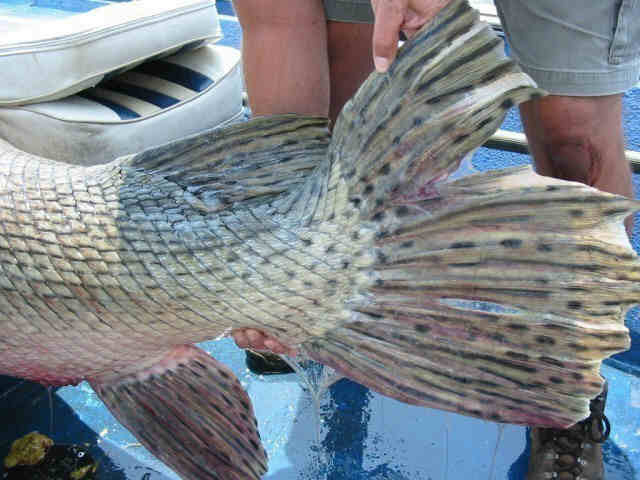 This is happening all across the river and the river is 400 feet wide. 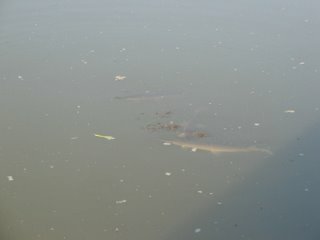 The pic shows three gars that have found some mayflies and are taking care of business. 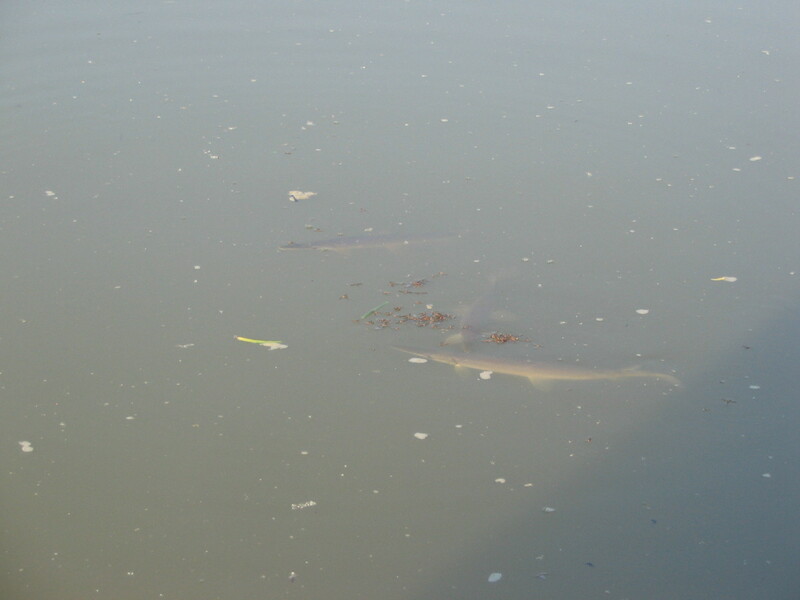 Of the other three common species of gars -longnose, spotted and alligator - I saw nothing. That’s below the water; above the water are the kites. They swoop down and up and back and around, and up again. They are catching mayflies in an almost casual way, nothing hurried or like that. Sort of like the gars, taking care of business. Some of the kites were close enough to follow the details (with binoculars) of what they were doing. I p icked out one in particular and stayed with it. As it flew it would go along and seem to just reach out with a foot and pick mayflies out of the air, and then transfer the insect to its mouth. Sort of routine, no big deal, but maybe just efficient rather than routine. 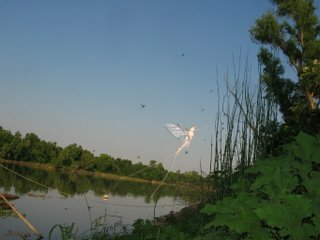 As I watched and timed it, it caught 22 mayflies, one at a time in one minute. What’s that? 1320 in one hour? Surely they can’t eat that much, so maybe half of that for breakfast? And they may be feeding young so you have to allow for that too, I guess. The one in the tree is full of food, for sure. On the banks of the river, the more terrestrial fauna is also taking advantage. Along the water’s edge there are centipedes, ground spiders and tiger beetles scavenging dead and dying mayflies. Not to mention the spiders with webs, all overcome with bounty - all with destroyed webs with mayfly carcasses hanging all over them. If spiders had freezers they could sure stock up for the winter. Wow. A cardinal crashes into a low-hanging bush and a cloud of mayflies erupts from it, forming a hazy smoke of insects around the bird. It picks what it wants while just sitting still on a branch and then flies off. How do they learn to crash into the vegetation? Is it really to flush the insects? Or is it coincidence? They don’t seem that clumsy at other times. The picture is one mayfly that is frozen in motion by the flash. Instead of the few you see behind it, think of ten thousand against the sky at sundown tonight. The river is still at 4.4 on the Butte La Rose gauge, not changing much for a while. Same with the Ohio and Mississippi. Yep, day six. Planing and looking, and planing and looking, and then keep doing it some more. 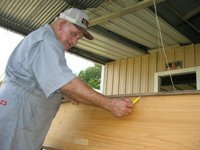 Edward told me a while ago that it would take at least a couple of days to plane the underside of the boat in preparation for putting the bottom on it. And it has taken two days, but we are ready for the bottom, probably next Saturday. I keep watching this boat gradually fall to the ground in little pieces cut off of it here, and there, and long curls of planed ribbons of cypress scatter over the ground. It gets smaller each time we meet to work on it and its shape keeps changing. But like Edward says, and Larry too, it sure is getting pretty. 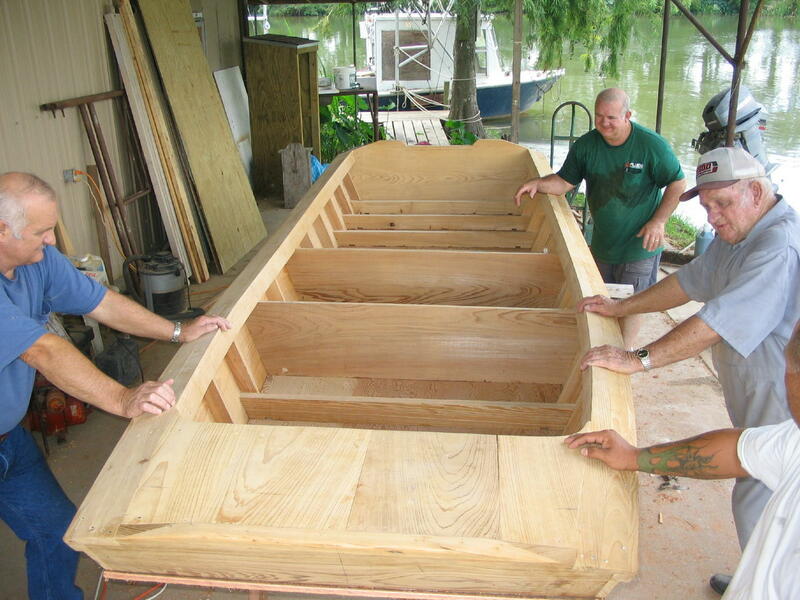 I also keep thinking that I haven’t expressed clearly enough how important it is for all parts of the boat that will touch the bottom to be absolutely flat and level. Being clearer is beyond me apparently, but I can’t think of how to describe it any better. Maybe the pictures included here will help explain it if my words fail to do it well enough. 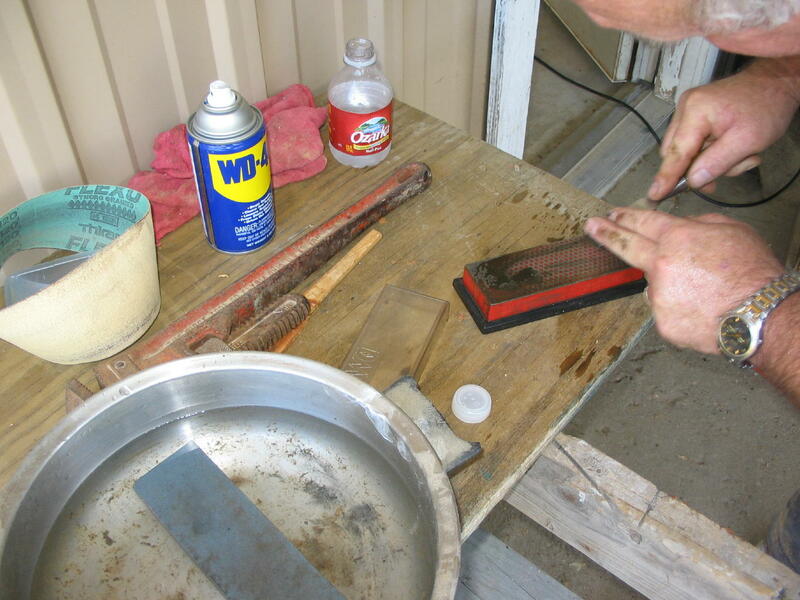 The tools for this stage are shown here: the planes, the straightedge and a sharp chisel. 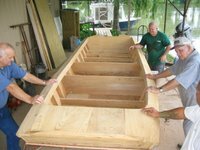 The day began where we left off last week: move the four-foot aluminum straight edge (a level in this case) along the ribs, gunnels, timbers, stern board and headblock until all of these are flat and level enough to satisfy the master craftsman – that would be Edward Couvillier. We did manage to get to that point today. 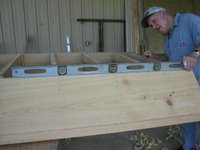 And, after this was done, the notches could be cut into the timbers. 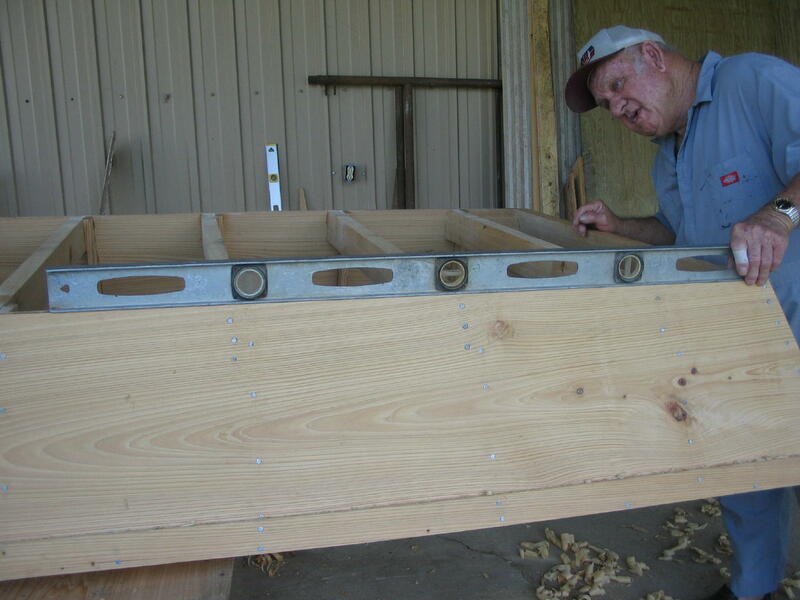 The purpose of these is to allow water to flow toward the back of the boat so that it can be collected and bailed out, or the plug in the stern board can be pulled out while the boat is running and the water can be drained that way. 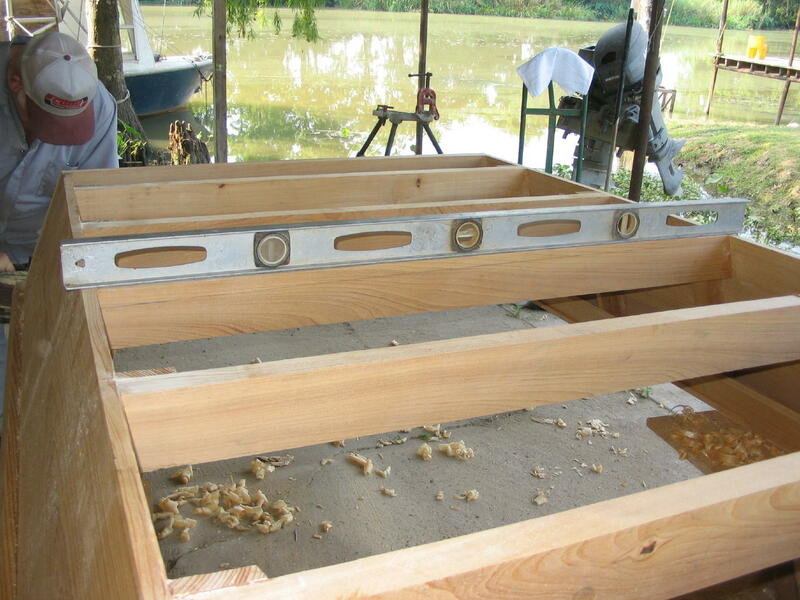 Without these notches the water would stay within each compartment between the timbers and be harder to remove. 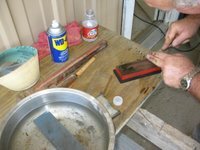 To cut the notches Edward marked them with a pencil and then cut the notches out with a sharp chisel, the sharper the better. A diamond sharp ening stone works well, as it the picture. The chisels were so sharp that you didn’t even need a hammer to drive them into the wood. Larry cut his finger on one and they are his chisels and he knows how to handle them. Even so, he cut himself. A couple of the pictures show the various parts that are finished and ready for the bottom. It’s funny, every project attracts kibitzers and this one is no different. It’s like a magnet for people. People just come and hang out by the boat, or lean on it and talk or smoke or just watch the work. I believe these people derive something from identifying wi th this boat, whether the visit is short or longer than short. One thing though, when I turn on the video camera they usually scatter like I had done something really scary. Odd. That’s the end of another really good day. Next time we may be able to fit the bottom on. I hope so. Lena Mae made a meatball spaghetti and red beans and rice and potato salad for dinner. Talk about good! The river is at 4.4 feet on the Butte La Rose gauge, and it will stay about there for the next five or so days. This is the earliest I have seen water this low in quite a few years. The Mississippi and Ohio are both falling so our levels will continue to fall unless some rain finds its way into the far northern watersheds. Of note: Carolyn and I rearranged the dock and raft at the river today. I do that every year during the low water cycle. 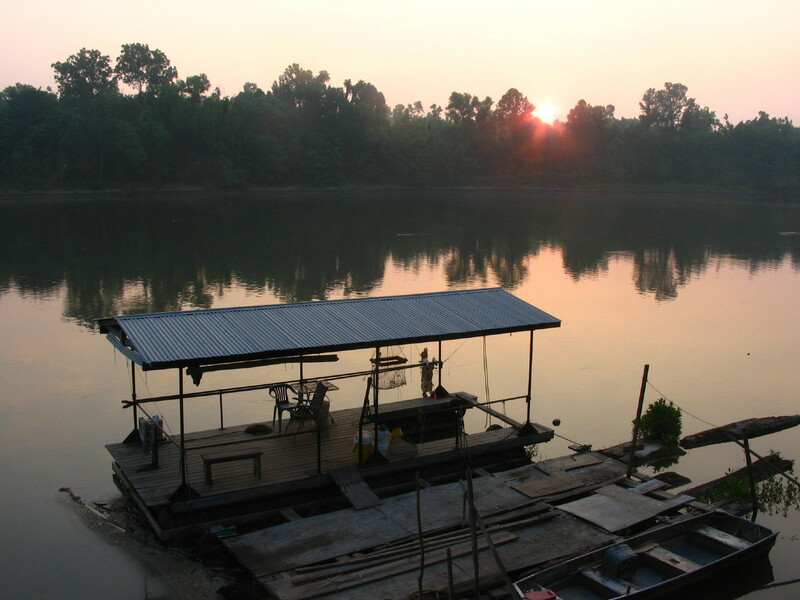 The result is that the dock is further out in the river if it sits on the outside of the raft, instead of end-to-end with it like it is in high water. And that lets my shrimp traps fish in deeper water and they catch better that way. So. Well, because of problems originating at the blogger.com end of things, this is the first time I have been able to load pictures in the last several days. This blogger.com service is a BIG deal on the internet. If you don't believe it, you should hear some of the comments being put on the user group discussion site. Apparently a lot of people are depending on using their blogs (sometimes six or more) to plan big national events like adventure races and if they can't publish they can't organize the events. Some of the comments I read you couldn't put on the radio, I garontee! In th e two pics you might recognize a certain cat's ear against the sunset, and in the other picture an Atchafalaya seahorse climbs aboard our dock for a night's rest. The really big happening at the river today was the continuing emergence of billions of mayflies. I got some really good pictures of them that I'll use next week, if the blog keeps working that is. I hope this improvement means that the blogger engineers are getting some fixes done. I have to go to Myette Pt. 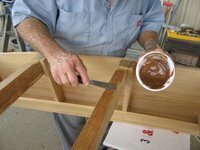 tomorrow for Day 6 of the apprenticeship boat building project, and I will try to publish a report, with pictures, tomorrow night. The river is at 4.4 on the Butte La Rose gauge and it will hold there for a few days. 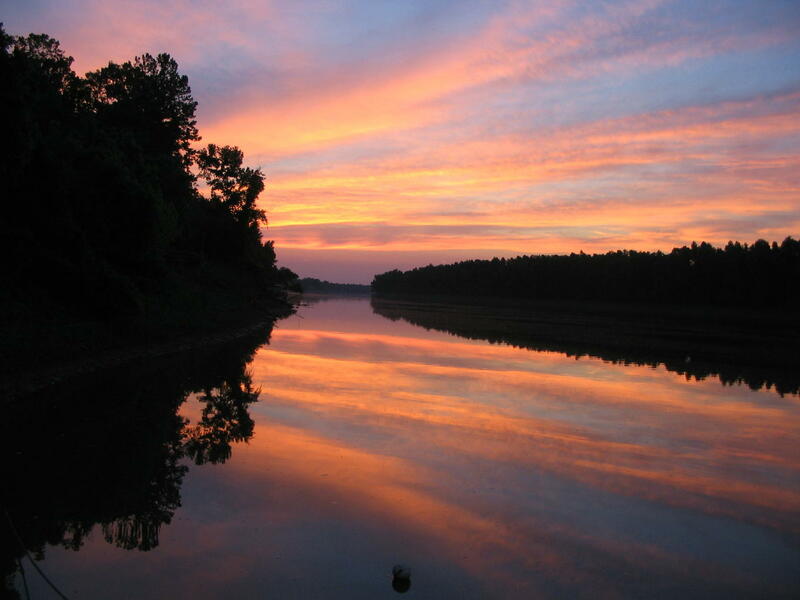 The Ohio and Mississippi are doing their gradual decline to the low water season.